Merkel's government has come under mounting pressure for not doing enough to crack down on vehicle pollution and for being too close to carmakers. DORTMUND -- German Chancellor Angela Merkel opened her re-election campaign on Saturday with an attack on the country's auto executives, pressing them to innovate to secure jobs, and win back trust lost by a diesel-emissions scandal. Merkel is far ahead of her rivals in opinion polls but is wary of complacency setting in among her supporters. She plans 50 rallies in towns and cities across Germany in the run-up to the Sept. 24 election, when she will seek a fourth term in office. 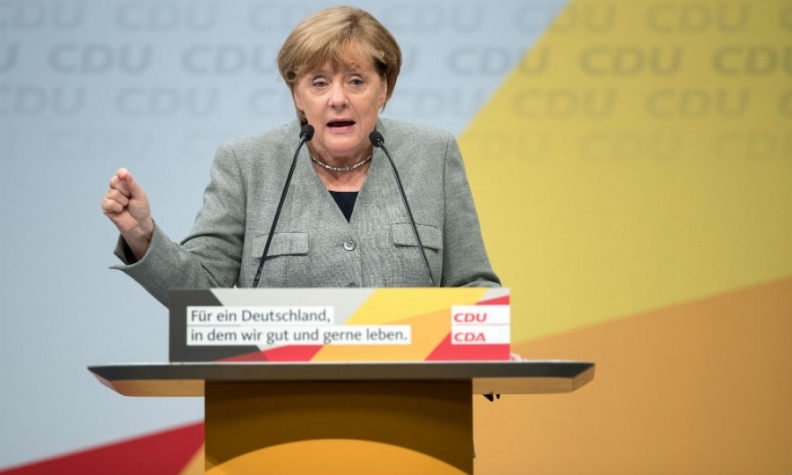 With her conservative Christian Democratic Union (CDU) campaigning on a platform of economic stability, Merkel ripped into auto industry executives for destroying trust in the sector -- Germany's biggest exporter and provider of some 800,000 jobs. "Large sections of the auto industry have gambled away unbelievable amounts of trust," she told a rally in Dortmund, in the heart of the Ruhr area that was at the center of Germany's postwar "economic miracle" but which is now a rust-belt. "This is trust that only the auto industry can restore. And when I say 'the industry' that is the company leaders," she added, to loud applause, pressing executives to behave honestly. By turning on auto industry executives, Merkel is trying to both push the sector to innovate and to head off a drive for more social justice in Germany from her main challenger, Martin Schulz of the left-leaning Social Democratic Party (SPD). Germany has enjoyed solid growth since Merkel took office in November 2005, and unemployment has fallen to record lows. Yet many people earn low wages and feel left behind in a globalized economy that has seen the gap grow between rich and poor. That sense of injustice and economic angst has been fueled by Volkswagen Group admitting almost two years ago to cheating U.S. diesel emissions tests, a confession that plunged Germany's auto sector into crisis. Earlier this month, German politicians and car bosses agreed to overhaul engine software on 5.3 million diesel cars to cut pollution and try to repair the industry's battered reputation. But many politicians fear Germany's carmakers are failing to invest enough in new technology and infrastructure. Wading into the debate, a Greens party state premier defended the diesel technology at the center of Germany's car industry crisis, saying it was a necessary interim solution on the way to electric cars. Winfried Kretschmann, premier of Baden-Wuerttemberg -- home to Mercedes-Benz maker Daimler, Porsche and parts supplier Robert Bosch -- said diesel was a clean technology that helped reduce the carbon dioxide emissions blamed for global warming. "We must cut pollution, we must fight climate change -- for which we need clean diesel ... and we must secure the car industry in Germany, especially in Baden-Wuerttemberg," Kretschmann told the Sueddeutsche Zeitung newspaper. Merkel rejected a proposal made by Schulz to introduce quotas for electric cars in Europe. "I don't think that the quota for e-cars -- for this technology -- has been well thought out," she said at the rally of her CDU and its employers' arm. "Then we would negotiate for ages in Europe. What would we do if it is not adhered to?" she added of the quota. Instead, Merkel called for a bigger picture strategy for helping the auto industry make the transition to producing electric cars. "We need to innovate quickly," she said. "Where companies can't manage it alone, the government must stand behind them and shove things along." Merkel's government has come under mounting pressure for not doing enough to crack down on vehicle pollution and for being too close to powerful carmakers. She has repeatedly warned against "demonizing" diesel engines. "We need diesel cars, we need gasoline cars, but we also need to make the transition faster to new technologies," she said. Her conservatives have promised tax cuts worth some 15 billion euros ($17.72 billion) annually as well as increased spending on infrastructure, defense and security. Merkel and the conservatives are expected to win another term, although an opinion poll by Infratest dimap published on Thursday suggested her popularity had dropped 10 percentage points to 59 percent. However, Merkel appears to have little to fear as Schulz saw his popularity hit a new low of 33 percent, down four points from last month.